Lemon Parmesan Roasted Vegetables are an excellent, easy, and healthy side dish perfect for a busy weeknight when you’re rushed to get dinner on the table or when you’re feeding a crowd for Easter or Mother’s Day brunch! They’re so simple to make, are super versatile, crazy delicious and will definitely be added to your weekly recipe arsenal. I’ve been sitting on this recipe for years. In fact, I’m certain I’ve mentioned this recipe somewhere deep in the archives, but I’m too tired to search and find it. Plus, I’m willing to bet the pictures are absolutely atrocious so it’s probs best for me to give it a redo anyway. 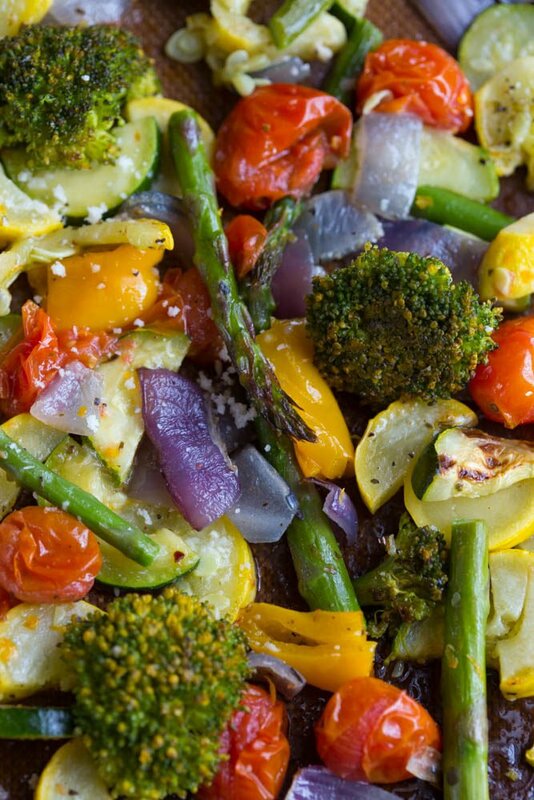 These lemon parmesan roasted vegetables are SO DELICOUS! I make them at least once a week for an easy, healthy side dish, and I almost always make them for dinner parties or on special occasions. They’re a total crowdpleaser and, it never fails, someone always swoons over them and chases me down for the deets before night’s end. The method for roasting these vegetables can be your go to for any veggies your family loves. It’s virtually a vegetable crisper clean out recipe so you can use any vegetable you have on hand or need to get rid of. I used grape tomatoes, garlic cloves, yellow squash, mini bell peppers, red onion, zucchini, asparagus, and broccoli. Chop the vegetables uniformly so they cook evenly, give them a nice bath in extra virgin olive oil, and top them off with a sprinkle of sea salt, freshly cracked pepper, and a pinch of Italian seasoning. After roasting them until they’re good and caramelized, pull them out of the oven, and immediately shower them with nutty Parmesan cheese, a tad of freshly grated lemon zest, and a coat of freshly squeezed lemon juice. Toss them all together and prepare to be dazzled by their citrusy, celestial flavor. Lemon Parmesan Roasted Vegetables are an excellent, easy, and healthy side dish perfect for a busy weeknight when you're rushed to get dinner on the table or when you're feeding a crowd for Easter or Mother's Day brunch! They're so simple to make, are super versatile, crazy delicious and will definitely be added to your weekly recipe arsenal. 8 cups mixed vegetables of choice broccoli, zucchini, squash, mini bell peppers, grape tomatoes, whole garlic cloves etc. 2. Clean vegetables and chopped into large chunks and uniform pieces. Cut broccoli into florets, slice zucchini and squash into half moons, trim asparagus and cut into thirds, half then quarter onions, and leave grape tomatoes and garlic cloves (w/ skin) whole. 3. 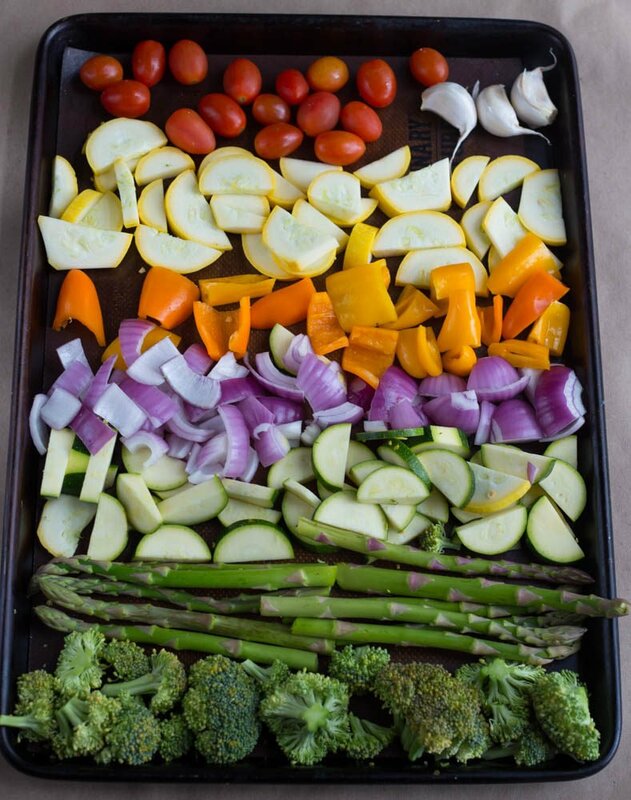 Place all vegetables, except garlic, in a single layer onto one or two large baking sheets, sprinkle with salt, pepper, Italian seasoning, and drizzle with 3 tbsp olive oil then toss to combine. Add garlic cloves to one corner of a baking sheet then drizzle each clove with 1 tsp olive oil. 4. Place in the oven and roast for 8 minutes. toss, then continue to cook for 5-7 minutes more or until tomatoes have burst and veggies are lightly golden brown. 5. 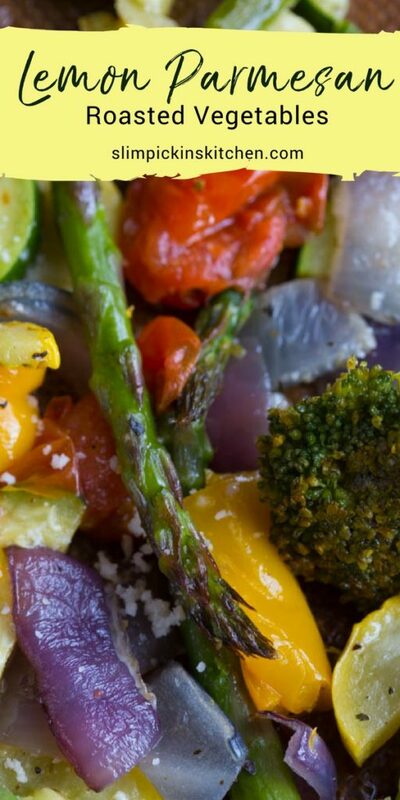 Take out of the oven, remove garlic cloves from baking sheet, immediately top roasted vegetables with freshly grated Parmesan cheese, lemon zest, and the juice of half a lemon and toss. 6. 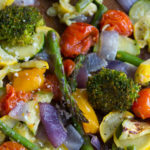 Carefully remove garlic from skins, lightly chop, then toss roasted garlic with the Lemon Parmesan Roasted Vegetables.